While in Grenada, we spent time touring the islands beautiful spice plantations. We experienced SCUBA diving in the incredible underwater museum. Monkeys even jumped on us. Everywhere we went, the scenery was breathtaking and invigorating. We had booked our time at the Rex Grenadian, outside of St. Georges. Resort life is a rare luxury for us and as relaxing and beautiful as our time on the beach was, we grew antsy and needed a change of scenery. 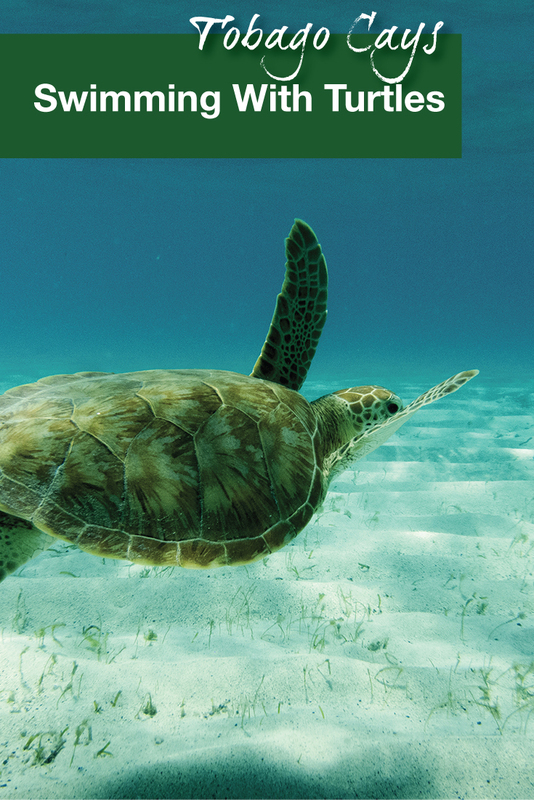 We spoke to the hotel tour operator and grew excited at the chance of swimming with Turtles in the Tobago Cays. We hadn’t planned on getting another stamp in our passports while in Grenada. But swimming with turtles in the Tobago Cays with Sunsation Tours, wasn’t something we could pass up. 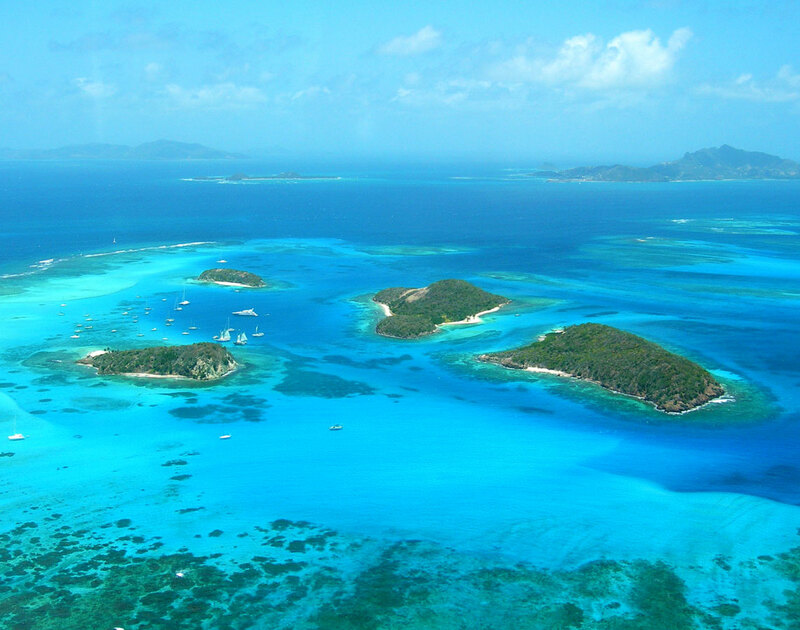 With the tour, we would hop on a puddle jumper and head to St. Vincent and the Grenadines, board a sailboat and head out to the Tobago Cays National Marine Park. 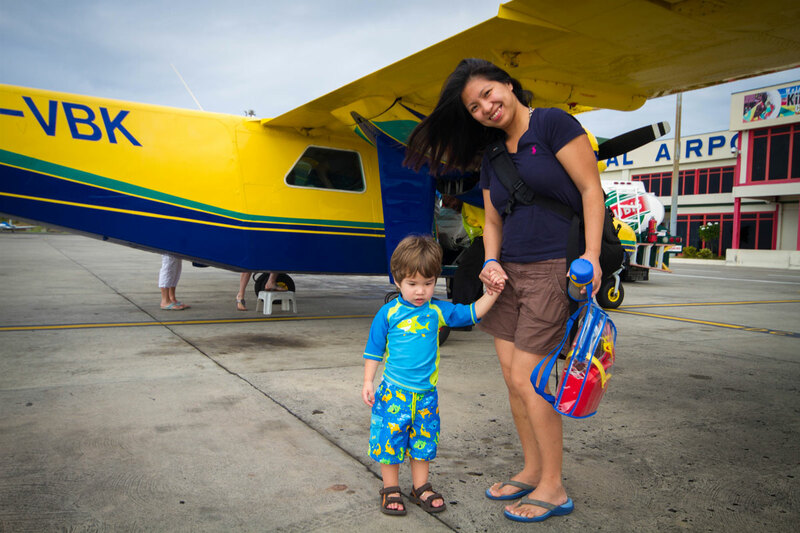 Before catching a cab to the airport, we put on our swimsuits and packed the diaper bag. We boarded a small, 9-seater plane for the trip. The loud hum of the engine had C in dreamland less than a minute into the flight! The flight to Union Island is only a 25-minute jaunt. On a clear day, it offers stunning views of the tiny islands that dot this Caribbean chain. Any one of them looked like the ideal island to be shipwrecked on with nothing but a chest of cold drinks and a great book. Pro-Tip: The flight is part of the tour package. There’s no need to book a separate trip. The plane landed on Union Island where a shuttle took us to the local marina. We boarded a skiff and made our way out through the luxury yachts toward our boat for the day, the Scaramouche. C’s eyes lit up when he first saw it and all he could say was “Pirate Ship!” over and over again. And what a pirate ship it was! The 80 ft wooden boat had actually appeared in the movie ‘Pirates of the Caribbean’, although dressed up much differently than it is today. The trip out to the Tobago Cays was incredible. The weather gods blessed us with hot sun and cool breeze as we zipped across the top of the waves. 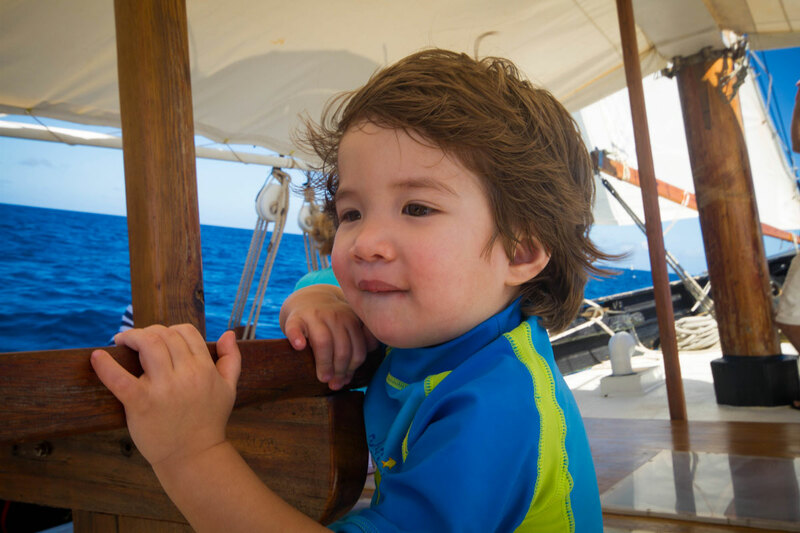 C could barely contain his excitement at being aboard a ‘real’ pirate ship and spent his time exploring every nook and cranny. Before long we came upon a group of islands. There was no question, based on the sheer number of boats anchored, that we had arrived at our destination. Pro-Tip: The tour comes with lunch and drinks to keep you energized for the trip. The Tobago Cays Marine Park is part of a small chain of islands halfway between the islands of Grenada and St. Vincent. The islands can only be accessed via boat. The Tobago Cays are part of a horseshoe reef and are often filled with private and charter yachts as well as small cruise ships. The closest airports are on Union Island and Canouan Island. But the rest of the journey must be made by boat. The Tobago Cays consists of five uninhabited islands that offer the picture-perfect Caribbean experience. Pure white sand, crystal clear turquoise water and shady palm trees. 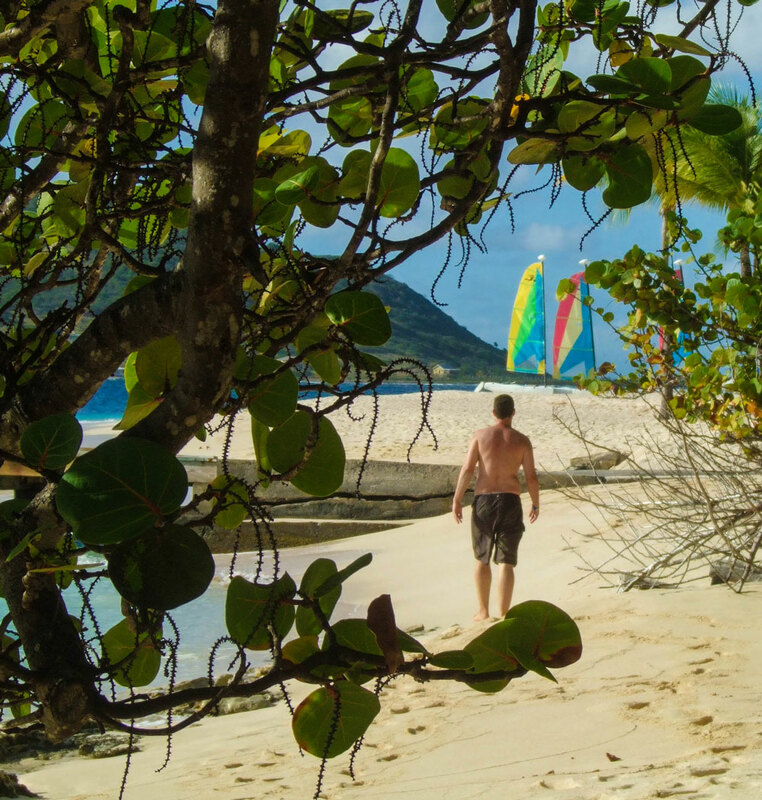 The crew anchored the Scaramouche and shuttled us to the pristine beach on Petit Rameau Island. This is where the marine park was set up to protect the local sea turtle population from boat traffic. To our surprise, the islands beach was basically empty. Most of the boaters opted to remain onboard their luxury yachts rather than explore the stunning islands. We, on the other hand, couldn’t wait to try our hand at swimming with turtles in the Tobago Cays! On Petit Rameau, C wasted no time plopping down into the sand and digging for shells. The sunshine made the water sparkle. It didn’t take long for us to dip into the crystal clear turquoise water. Christina and I took turns snorkelling. While the water wasn’t teeming with turtles, we caught a glimpse of a few beneath the waves. After some coaxing, C finally agreed to ride the Daddy boat out to the deeper water. C was thrilled at the idea of seeing some turtles for himself. He held on to me for dear life, and just as he was convincing me to turn back, we were graced with a turtle popping its head above the waves just a few metres from us. The view was almost enough for him to forget how deep the water was around him. But he remembered soon enough, so we headed back to the beach. 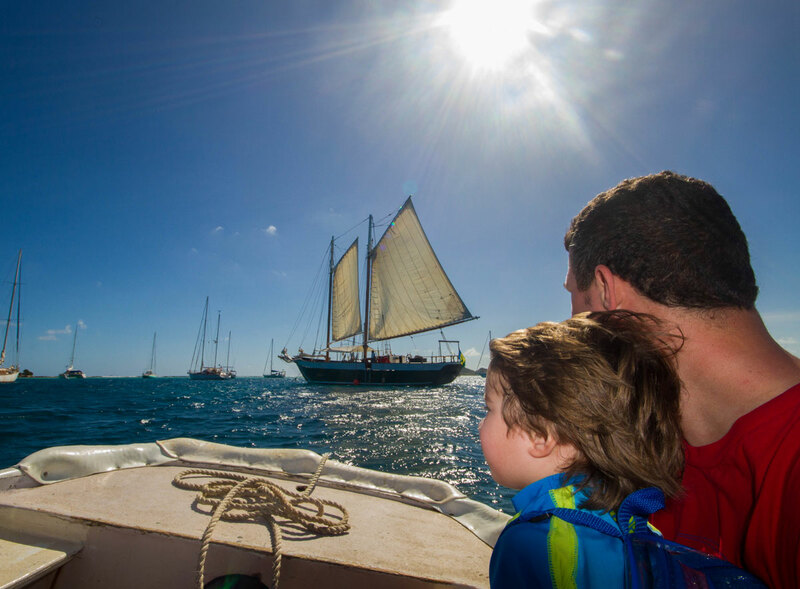 We re-boarded the Scaramouche and left the stunning Tobago Cays behind us as we set sail towards Palm Island. Palm Island is a private island resort at the southern tip of St. Vincent and the Grenadines. The stop gave us some more beach time. C took his time building castles in the shade of the palms while Christina and I wandered the beautiful beach near the marina. Because Palm Island is private, as visitors we only had access to a small section of the beach immediately adjacent to the dock. I did get a chance to visit the infirmary briefly after stepping on one of the many sea urchins hanging around the sea floor near the dock. The nurse was very nice. ProTip: Beware of spiny sea urchins in the waters of Palm Island. These urchins aren’t poisonous. Stepping on them just hurts. Wow looks great! Want to do this but will wait until our daughter can swim. I love snorkeling. I haven’t been to Grenada and the islands nearby yet, but I think it is near the top of my list. I’m going back to Barbados this Fall, but hoping to branch out to new islands for the Winter and Spring. I am definitely going to look into this trip! Swimming with turtles can be so much fun. They’re really sweet creatures. They really are so amazing! We would love to visit Barbados. I hear the water is incredible. This looks so fun! I like the sound of an underwater museum, and Palm island sounds like a lovely final stop (minus those urchins, yikes!). Oh wow Tobago looks stunning. That sea turtle pic is just awesome too – Was the water rough, wavy or calm? I love snorkeling in calmer waters – so much easier, haha. I bet a dive here would mean you get to see a lot of turtles and underwater life, eh? Ahhh! This looks AWESOME! And the last photo of the sleeping little one is the best. Oh I love your photos and this fun family trip you went on. Great tip about the spiny sea urchins. For some reason I thought they were poisonous! Good to know they’re not. So many things I love about this post; the colour of the water, the turtles, the wonderful family memories! Oh, and the photo of a happy, exhausted little boy. What a fantastic experience for you all. Swimming with turtles is such a cool experience. I’ve gone snorkeling in Maui and seen one turtle, but it quickly swam away. I’d love to do it again. The Tobago Cays Marine Park looks and sounds absolutely stunning and I can’t quite believe how blue the sea is! Swimming with turtles must have been such an awesome experience, especially for the children. Great turtle pics too! Thanks for sharing. What a gorgeous place! I love snorkeling and my favorite part is watching sea turtles. They are so cute and playful! Would love to snorkel inTobago Cays one day! Wow your son has had some amazing experiences for a little one! Sounds like literally the perfect fun family trip. 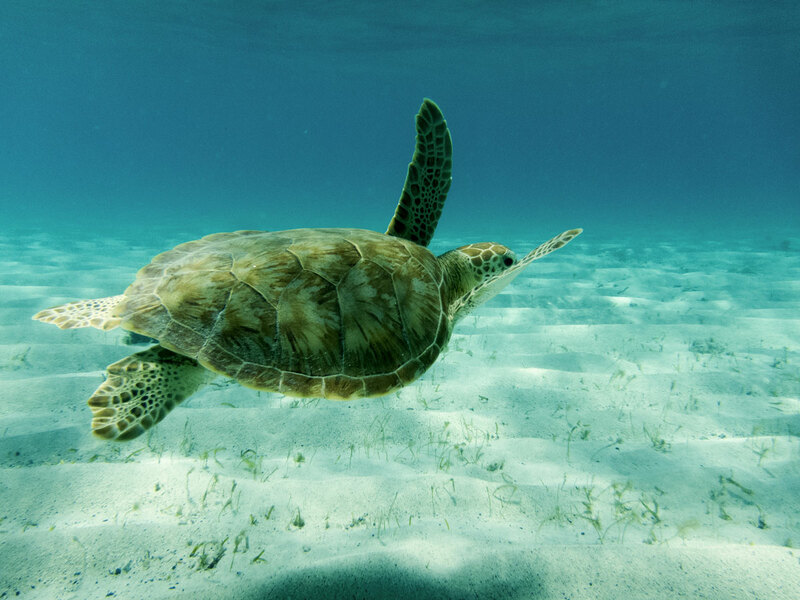 Even the plane ride sounds cool, let alone swimming with turtles! What a fantastic trip! Your little one is so fortunate to be taken on these marvellous experiences at such a young age. I’d love to go swimming with turtles here – I’m a bit obsessed with turtles, fascinated by them! We take a family trip to the Caribbean every winter, and we will definitely be adding Tobago Cays to our list. This looks like a great activity for when we get tired of laying on the beach all day. Beautiful photos and thanks for sharing! Wow! Looks like a paradise! I love snorkeling and seeing the life under the water. It is so exciting. That water looks so inviting. I have never been in Caribbean but most definitely want to go there! Swimming with the turtles under the water is a great experience. The fascinating world beneath the water must have assumed a totally different dimension when swimming with the turtles. WOW! I am adding this to my bucket list when we get to Caribbean!!! I have stroked with turtles in Hawaii when I was a kid, but can’t wait to share this with my little ones! I’m totally jealous! If it weren’t for my way-to-fair skin, this would be my perfect vacation. Plus, I think your son is extremely brave for swimming with turtles in too-deep water! 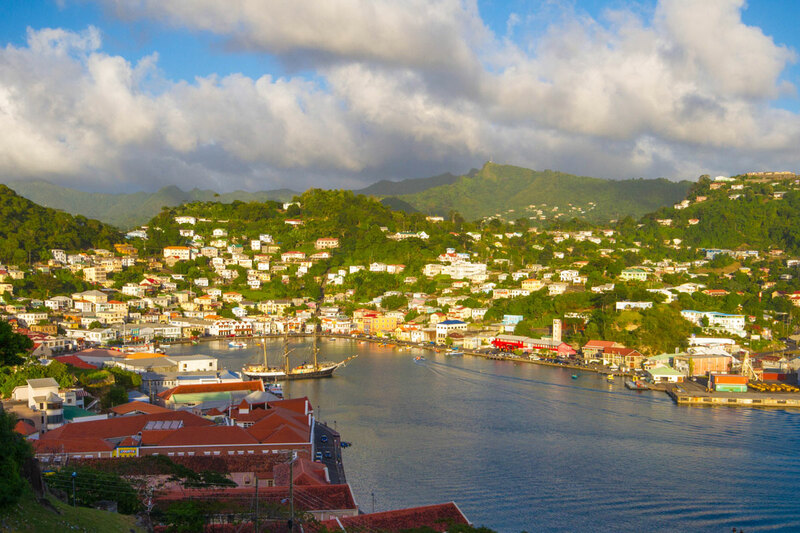 I haven’t been to Grenada…yet! This is definitely an activity I would love to do. Perfect thing to do while on vacation in the islands. This looks so cool! I would have been all over this when I was a kid. I was obsessed with sea turtles! Such beautiful photos and memories you have! Thanks for sharing a wonderful experience! I have not been swimming with turtles but I would love to, I can only imagine what a great experience it would be. Snorkeling is a lot of fun and I would love to learn how to Scuba Dive one day too. So much beauty to see under the sea. Looks gorgeous 🙂 Our friend has been to Grenada over 30 times. She is not that obsessed LOL. She goes on business. Always raves about the place. I see why 😉 From the beautiful waters, the ample wildlife and the laid back vibe, this island has all the trappings of a tropical paradise. On the list. Maybe a quick trip from the Tri State is in order before the holidays 🙂 Thanks for sharing! C’s little outfit is too darn cute! Glad to see activities that kiddos can enjoy as well as the adults! My friend has a kiddo around C’s age and this would be perfect for her. What a wonderful place! I fell in love for it just looking at your pictures. Swimming with the turtles must have been so much of fun. Your little fella looks quite happy and peaceful. This is a great age to take them. All they do is have fun and fall asleep without any fuss when they are tired. Swimming with turtles sounds like an amazing experience, especially for the little one. We find it really awesome when kids are able to relate things like pirate boats and turtles, that would be a great learning for them. Swimming with turtles sound so exciting and adventurous! Seems like an ideal destination with kids. My kids are beyond this toddler age but they too will enjoy for sure. How sweet 🙂 I love that the turtle made your child forget all about fear, if only for a brief moment. Looks beautiful and totally worth a visit. Thanks for the warning about urchins – ouch! Talking of Turtles reminds me of the cool heard from Finding Nemo. I bet it was a great adventure and im sure the little one enjoyed it a lot. Sounds like an incredible experience.Fantastic images.Your lil one is so cute he looks very exhausted after this amazing experience. What beautiful pictures! The water looks like a dream, and Palm Island looks like the perfect beach stop. It seems like you made great memories! This looks incredible! I have wanted to go to Grenada and even considered it for my honeymoon. The waters look beautiful and the turtles just so happy and content. What a beautiful island! I very much like stories about island-hopping, about the sometimes unplanned logistics that will surface from such places. I hope the turtles appreciated your visit, and gave you all the hospitality one is due. Such a beautiful Earth! Look at all its colors and diversity of nature! I recently returned from the foggy green mountains and now I see the azure water and white sands. So amazing! You are very lucky to have seen the turtles in their natural environment. Swimming with turtles sounds like a breathtaking experience and your trip looks so much fun! Thanks for sharing your adventure with us! The Caribbeans have some of the most gorgeous islands. Swimming with the turtles is actually a quite amazing experience. I had the same when I was in the Gili islands of Indonesia. Aww thanks! We think he’s adorable as well! And you’re right, it IS paradise there! The Tobago Cays look amazing! I would love to go swimming with the turtles someday! Wow, this is so nice. We have not been in this area yet, but we spent some time in Bali and on the Gili Islands a couple of months ago and had a similar experience over there – so amazing!!! We would love to get to both of those places! This is something that I haven’t done yet, swimming with turtles. I remember when I went to El Nido and there’s this Chinese tourist who went off on his own and when he returned he reported that he saw turtles while he was snorkeling. The boatman said that he is lucky, apparently, you don’t get to see that many turtules in that area. May I say that I’m impressed with the boat you got on. I mean I’ve never taken such a beautiful looking boat before. And wow that’s a beautiful shot of the turtle there. 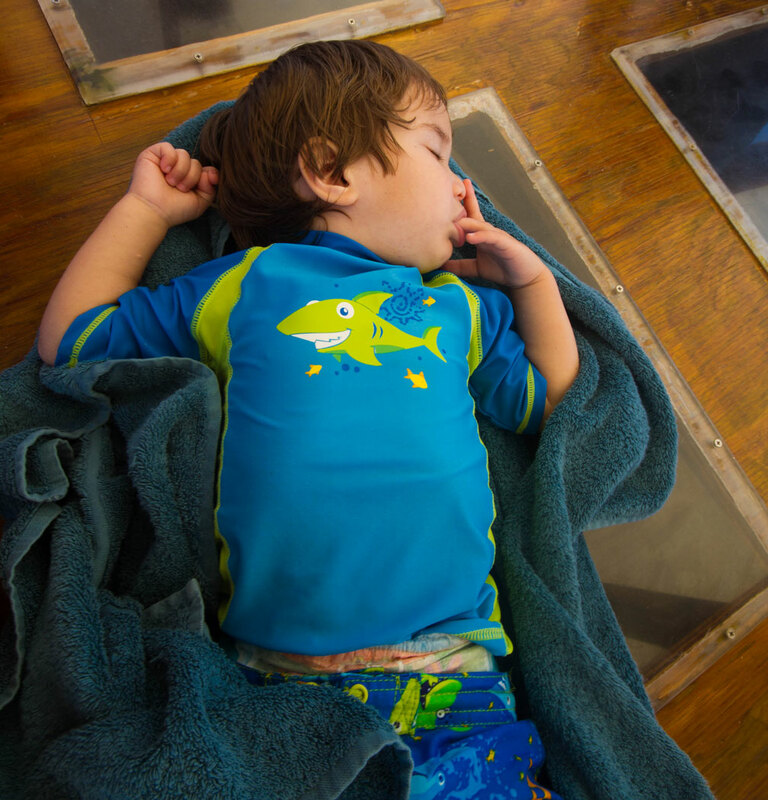 What an awesome experience and activity to do in Tobago… Your baby surely enjoyed the trip that even in his deep sleep, he seems to be still dreaming about it.